The Timer That Meets All Pinewood Derby Challenges! The DT8000 Timer and Finish Line is our original full-featured product. It's awesome! This pinewood derby timer lets you time any track from one to eight lanes, determine the finish order and has an interface to a computer which allows you to display the finish order and the times for all lanes. Versatility is key for many racers and this timer will allow you to configure it yourself to run on tracks as small as a 1-lane track as well as larger tracks --- up to 8 lanes! You do not have to worry about detailed track specifications or options. This timer will install onto any track in less than 60 minutes. This timer has several options for displaying the results at the finish line. These are detailed on our Large Screen Displays page. The best part about these options, is that you have a choice! You can choose the option that is the easiest for you and will most likely be the least expensive, because you can use equipment that you may already have or have access to. 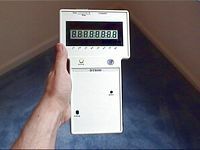 For those groups that have access to a computer, the DT8000 Digital Timer and Finish Line can be connected to a desktop or laptop computer for displaying the results. The computer is not necessary but is a fun way to see who won! There is no software required or additional charges, however it allows you to easily display the results of the race on the computer. You can use the DT8000 with four race management programs: RaceVIEW, DerbyMaster, GrandPrix Race Manager and Racetender. NewBold Products sells three of these software programs, packaged with our timer. For more information on software and computer options, check out our Software page. The Pinewood Derby DT8000 Timer has some truly great features!! Mode 2: For two lanes. Determines the elapsed times and Order of Finish for both lanes. backlog)! Please mention your race date to us so we may prioritize your shipment. 30 - 60 minute installation time is all it takes! Uses optical stop sensors for each lane, which must be installed on the Pinewood Derby track and have 10 foot cables (sensors are NOT affected by flash photography!) You must install a light above the sensors. Use a 60W incandescent bulb about 3-4 feet above the track. Compatibility with RaceView, DerbyMaster and GrandPrix Race Manager Software; you can purchase any of these three software programs from us. Pictures and detailed manuals can be found on the Questions page. We take VISA, MasterCard, Discover, Checks, Money Order and COD. Our DT8000 Digital Timer includes the Timer, Starter Switch (with Cable), 3 Finish Line Sensors and Cables, 9V battery, Operational Manual, cable mounts and ties. This is the same price whether you are using it on a one lane track or even up to an 8 lane track. If you purchase the DT8000 with the custom carrying case, you can save some money buying the two together. If you need more finish line sensors, you may purchase these also. An optional Computer Interface Cable is available from us or you may purchase it at a computer store. This is a 3 meter (9.84 ft) DB9 Male to DB9 Female Cable. We have a simple 90-day money-back guarantee. We also offer a six-year parts and labor warranty if you were to need repairs on your product.